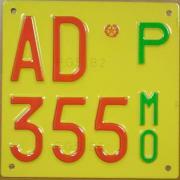 This kind of plates were used on bulldozers, street cleaner vehicles and other machines like these. 1992-1994: before 1992 all these vehicles had not a plate at all and in 1992 the plate that you see in the first picture was introduced. It was red on yellow, with the origin code (see table) and a letter on the top line and the rest of the serial number with the format A000 on the bottom. Letters B, C, D, G, I, J, O and Q were skipped and if the owner moved into another province, he didn't need to change the plate, as it happened with all the other kinds of plates before 1994. In this same time towed work vehicles had a different plate placed on the side. It had red characters on yellow background with the origin code followed by a serial number with the format A0000 and there was the print "MACC. OP." (Macchina Operatrice) in black on the top. These vehicles had also a repeater plate, exactly as it happened for the trailers (picture number 3). 1994-Today: the second picture shows a plate issued after 1994 and its format is very different, even if the look is almost the same. It hasn't got the origin code any more, like all Italian plates issued after 1994, and the new format today is: AA*A on top line and 000 on bottom line, where * is the seal of the Italian Republic. Also plates for towed work vehicles haven't changed their look, but their new format is AA*A000 where the * is the seal of the Italian republic, with all the digits placed in just one line under the print "MACC. OP." (picture number 4). 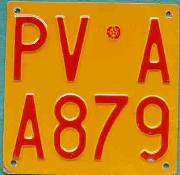 There are also test plates for work vehicles and they were introduced in 1984. 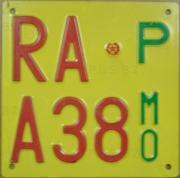 Until 2003 they were exactly like test plates for agricultural vehicles, but with the letters "MO" (Macchina Operatrice) instead of "MA" (pictures number 5 and 6). 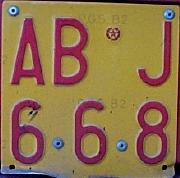 Then in 2003 normal test plates for all vehicles started being used. Many thanks to Alessandro Libanore for the first of these pictures and to Guglielmo Evangelista for the third picture and for the history of these plates, and to Adolfo Arena for the pictures number 3, 5 and 6.